If you like PC gaming but do not have enough money to spend on high-cost gaming PCs, you can think of building your cheap gaming system. If you are doing the same, you need a good but low-cost gaming keyboard as well. I have already listed best gaming mouse under Rs. 1000. Now you need a good budget gaming keyboard. A keyboard is an important part of gaming. You will be spending hours on pressing keyboard keys while gaming. So, the keys must be responsive and comfortable. It must be strong enough to sustain gaming sessions. While Rs. 1000 budget is not big enough, so you have very few options. Still, you can get a good budget gaming keyboard. Here is the list of best gaming keyboards under Rs. 1000. Below is the list of Best Gaming Keyboards Under Rs. 1000 that you can buy in the budget. If you interested in gaming and want to a cheap gaming keyboard, here are the best options. Zebronics Radiant is a good gaming keyboard for just Rs. 999. It has attractive RED LED illumination to look attractive. It has smooth curves and a sleek finish. There are 106 less and 10 hotkeys. It has a USB 2.0 interface, so it can be used with a desktop laptop or gaming stations. Redgear Blaze 3 comes with a full aluminum body. It also has Floating keycaps for mechanical feel. This gaming keyboard comes with 3 LED color backlight and a Windows key lock for uninterrupted gaming. It is designed for gamers to give them good gaming experience. 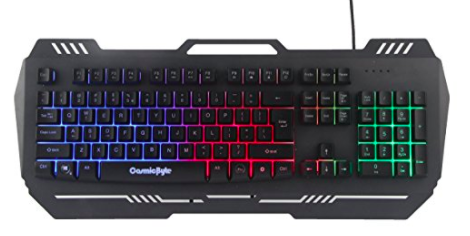 This gaming keyboard comes with 7 Color RGB Backlit, 4 Levels of Brightness Adjustment and 9 Backlight Effects. It has easy to clean keys that claim to be scratch resistant. With up to 10 million keystrokes life, it is long lasting. There are also 19 Anti-ghosting Keys. Night Hawk NK102 FPS is also a good gaming keyboard in the budget segment. It has 3 LED backlit key to enhance your gaming experience. This keyboard gives good gaming experience even with long gaming sessions. It also looks good. This is another good gaming keyboard that comes with nice experience. It has internet hot keys and Anti-ghosting Keys. It comes with Scratch Resistant Keys that are also easy to clean. Rs. 1000 is not a big budget for a gaming keyboard, still, you have few good options. If you have a tight budget, you can go with any of these Gaming Keyboards Under Rs. 1000. But I will recommend you to increase a budget to keep it up to Rs. 2000 for getting better options. I hope you find this article helpful. If you have anything to ask, you can always leave a comment below.